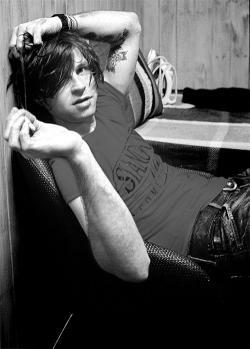 David Ryan Adams (born November 5, 1974) is an American singer-songwriter, musician and producer. He is best known for his prolific solo career, and as a former member of alternative country band Whiskeytown, with whom he recorded three studio albums. In 2000, Adams left Whiskeytown and released his first solo album, Heartbreaker, to critical acclaim. The album was nominated for the Shortlist Music Prize. In 2001, Adams released the UK certified-gold Gold, which included the hit single, "New York, New York". He released five albums with the rock band The Cardinals and in 2009 Adams married singer-songwriter and actress Mandy Moore. Adams left The Cardinals and announced that he was taking a break from music.He resumed performing in October 2010 and released his thirteenth studio album, Ashes & Fire, on October 11, 2011. The album peaked at No. 7 on the Billboard 200. In September 2014, Adams released his fourteenth album Ryan Adams on his PAX AM label. Adams has also produced albums for Willie Nelson, Jesse Malin, Jenny Lewis, and Fall Out Boy, and he has collaborated with Counting Crows, Weezer, Norah Jones, America, Minnie Driver, Cowboy Junkies, Leona Naess, Toots and the Maytals, Beth Orton and Krista Polvere. He has written Infinity Blues, a book of poems, and Hello Sunshine, a collection of poems and short stories.